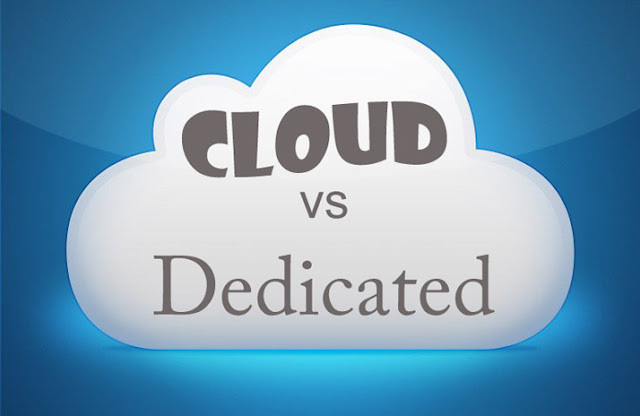 The rate at which the cloud industry is flourishing in today’s IT world, the choice of cloud hosting vs dedicated server has become an eternal topic of discussion. There are literally thousands of forums, discussion boards and blogs on the Internet that are discussing this in lengths; most of them being one-sided (no points for guessing that they're in favor of cloud hosting on accounts of its numerous benefits). But, I wanted to do a brief neutral comparison without being biased towards the cloud hosting… So, let us also kick-start the comparison with the basics of these technologies. A basic server costs in the range of $50 to $100 per month, and the cost goes up depending upon the features that are offered as a part of the package. Once you purchase one of these, there normally is a waiting (set-up) time required for installation… And, the server is actually set-up by somebody, as opposed to cloud hosting, wherein just an instance is created in the cloud, and the user can access it within a matter of few minutes, since the time needed for setting up an instance is obviously far lesser than time needed for setting up a complete web server. Performance-wise both of them are quite comparable. Dedicated servers are as fast as their cloud counterparts; however, there is something called "dirty" instance in the case of dedicated servers. It is quite normal to see a computer slowing down over a period of time due to too many unwanted program files and temp files running on the server. This can actually be the same even with cloud servers but here you have the ability to switch to a new instance leaving a “dirty” instance behind, cleaning up that machine without interrupting things, and then moving back to the same machine in a hassle-free manner. However, in the case of a dedicated server, there's no such possibility of a backup kicking in, and your website/web app directly goes on in the case of a server crash, and there is no interim solution available until the server is repaired, and gets up-and-running again. Virtual private servers, of course, offer a midway solution between the two and offer the benefits of a dedicated server at a significantly lower price. So, after reading the good and bad about dedicated server hosting as well as cloud hosting, I reckon, it'd be quite easy to make a choice, but I’d still like to hear the opinion of readers – what do you reckon? Do you also suggest cloud all the way or is there something that still keeps you interested in dedicated servers?